Do you or your horse have any of these symptoms? Is your current saddle causing pressure points on your horse’s back? Does your horse have chronic leg or back problems? Is your horse developing a bad attitude about riding? Does your horse give you the “evil eye” when you tighten the girth? Does your saddle’s girth rub behind the elbow? Does your saddle crawl up on the horse’s withers? 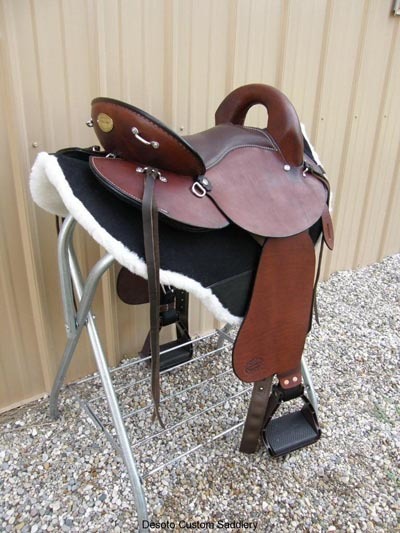 Do you have difficulty mounting without the saddle slipping? Do you experience ankle, knee, or back pain when you ride? Do you feel insecure in the saddle? Does your horse shorten his gait when being ridden? A custom saddle may be in your future! Read our FAQ (frequently asked questions) page to learn about how these symptoms can be alleviated by a custom saddle designed especially for you and your horse by Desoto Custom Saddlery!